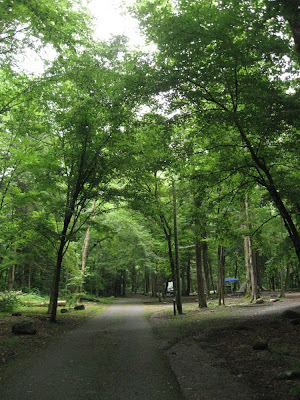 Part of the appeal of summer visits to the Great Smoky Mountain National Park is the wealth of natural green pleasures. A brief afternoon stroll among the trees was the best of desserts after a simple lunch of cold cuts, cheese and fresh fruit at our Elkmont campsite in July. This is beautiful, and even the air would be so pure! I love that shot. It just draws you in and makes one want to investigate. How lovely that shade of green is. I wish my neighborhood had such a wonderful canopy of trees. Hi Linda, As you know, I'm a fan of green! When I am in the Redwood forest or up at Lake Tahoe, I breath deeply of the earthy smells and absolutely know what you talk about when you say balm for the soul.